Provided you like eggs that is (and if you don’t, I really can’t help you on that one… I’m just going to look at you funny). I’m a big fan, personally, and this quick and easy dish (if you can call it that) combines my love of both a hard-boiled egg as well as a runny yolk. It’s fast and simple to prepare, and incredibly delicious. Tony & I often eat them for breakfast, but we will sometimes make them for dinner to if we’re looking for a lighter (or quick) meal that requires minimal fuss. For a real British twist, just add baked beans! The whole concept behind “Soldiers” (as we call this meal in our house… even though that only refers to the toast portion of the meal), is that you soft-boil your eggs so that the yolks are runny rather than firm. You then cut your toast into thin strips and after lopping off the top of your egg, you can dip your toast “soldiers” into the yolk. I have no idea why the toast slivers get called soldiers, you’d have to ask the Brits about that one. What I do know, is that it’s delicious! 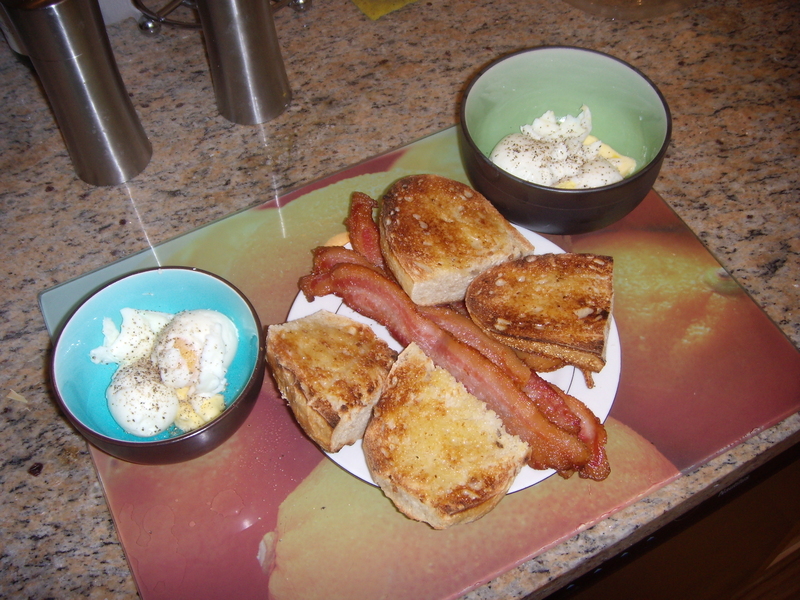 To do the whole dipping thing, it’s pretty much essential that you have an egg cup in which to rest your egg. We do not have egg cups, so we do a modified version of this, where we scoop the eggs out of their shells and just mash ‘em up in a bowl (or a mug) with some butter, salt, and pepper. You can then dip wedges of toast into the bowl/mug, or do as I do, and spread the eggs on your toast (so, I effectively remove the whole soldier” aspect from the equation). The first couple of times Tony and I tried to make this meal, we screwed up loads and went through about a half dozen eggs, because we either over- or undercooked our eggs. The perfect soft-boiled egg will have a runny yolk, but the white of the egg (the albumen!) is nice and firm. We’ve found that the best means of achieving this is by putting the eggs in the water at the start before it begins to boil. I normally wander away and putter within earshot of the stove while I wait for the water to reach a rolling (i.e. full) boil, which means the eggs generally are in the actively boiling water for about 30 seconds before I remove the pot from the heat. Then we set a timer for about 2.5 min, and let the eggs rest in the hot water (but put the pot on a cold burner for this rest period!). [If you’re going to do toast with the eggs, now’s the time to put your toast in the toaster.] Then when time’s up, we place the eggs in a bowl of cold water and begin to crack them open. Normally we just crack the upper third of the egg and then scoop it out into a bowl that’s already got a bit of butter in it, mash everything up, and add salt and pepper to taste. All told, you can be munching on a pretty scrumptious meal in less than 10 minutes. This dish is guaranteed to sooth your tummy and your spirits on stressful days, and is great for lazy weekend breakfasts too.